IIRC the map of Zelda: BOW was on the Gamepad and people rightfully expected more features to be on the Gamepad, stuff like an inventory and additional gimmick stuff. Now they came out not only saying that the game is completely playable with a pro controller, but they also ditched the entire Gamepad stuff: the map is on the game screen just like the inventory and equipment screens, there hasn't been any touchpad-related stuff in the game and also no waggle in sight. There was a Gamepad touchpad message in one of shrine segments and Chiko used the Gamepad gyro. Not being able to use the Gamepad for things like cooking stuff doesn't seem like a good idea to me. Hold on where is this info from? That said, there isn&#8217;t much of a Wii U identity to this game. The game can be played with the console&#8217;s signature GamePad controller but can also be played with the conventional screen-less Pro Controller. Aonuma said that players using the GamePad can use that controller&#8217;s screen to move the game&#8217;s display to the GamePad screen, but that screen doesn&#8217;t seem to do much else. The map-on-gamepad was obvious a big feature they highlighted previously, and the ingame slate obviously should've been the gamepad. It's easy to assume they took out the gamepad specific features they had planned to make it 100% the same experience on NX. I was thinking about how huge the game is and how many things you can do, and don't shoot me but... I'd love if Nintendo had an achievement system just for this game. Or at least an online component with statistics, allowing you to compare with friends. I'd like to have some sort of incentive to find everything and complete this game 100%, with all mini-dungeons and the like. I'd love it if there was a stat screen showing the % of players that found certain areas, completed everything, etc. Wow. So basically their saying after years with the second screen they decided it was valueless. No, it's a little lie because saying "we had a lot of cool stuff planned for the gamepad but took it out when we decided to release this on NX also" wouldn't sound so well. This is the first very bad news about the game. I only just realised that he used an updraft created by the fire in order to gain the extra height for the shot. That's so cool. And now whenever I see fire in this game I notice the air rising from it. A handy way to get to higher ground you can't climb? Same here - just made the connection this morning. It's not bad news persé, games often have features during their development that gets removed for various reasons. A good thing might be that switching this to NX gave them an extra year for polish and other neat features. So GameXplain is going to do like a 3 hour video on just Zelda, right? This game is absolutely gorgeous, it's so beautiful and as it was mentioned before, it reminds me of Ghibli films. If you're a gamer, then you should definitely buy this game, I'm sure that I will buy it DAY ONE. - Beautiful world. I want to get lost in it and make awesome discoveries. - RPG elements: Crafting, loot, a variety of weapons and tools. - Choices: A variety of ways to tackle challenges, obstacles, and traversals. - Voices. How much there is remains to be seen, but it's there. Feels more immersive. - Art style. I'm convinced the style actually helps the game from looking outdated. With games like Horizon Zero Dawn coming out a month before, Zelda just wouldn't be able to compete with that in the realistic realm. The style helps give the game some personality and life while compromising visual complexities that would come with a realistic style in a open world with Wii U tech. But anime is not mainstream around the world, and it's not going to start with this game, but I do like it and think it was a good decision for this last Wii U adventure. - Too easy. Push 'b' to win. Combat encounters don't look very interesting at all. Enemies don't appear threatening. I expect some context to the enemies being where they are will be given through the course of the story, but man are they pushovers. Obviously the challenge will increase as the game continues on, but by how much is still in question. Being too easy makes for a boring game and goes against the spirit of Zelda 1 which was a tense game that begged you to explore the world and gather money to make surviving that dangerous world achievable. - Peaceful world/lack of danger. Zelda 1 had a dangerous world with a number of encounters that are best avoided. Not many squares were rest spots. BotW's world is very big and relaxing, which is not a bad quality, but it's not what I'm looking for in an epic Zelda. I'd like to see dangerous hostile encounters that you can win, but will mostly likely fail until you can acquire stronger gear. Make escape a convincing option worth taking. - Link's design. No wonder there is a silly fan movement going on. Guy looks like a wimp. I bet if Aloy and Link got in a fist fight, Aloy would beat Link's head in. - Music is hit and miss. Love the trailer song. That battle theme however is terrible. I don't like it. I guess it's fitting for the pushovers that are the games enemies though. - Combat. Skyward Swords sword combat system will be missed. This game has a lot of potential though with the various items and exploits I've seen on the streams, but I remain concerned since options mean nothing if there is no value to them. Harder options in combat should yield greater rewards with higher risks while easier options are low risk and less rewarding. Right now, the reward of say, trying to exploit the physics by bowling a bomb down hill and destroying enemies is simply the fun of exploiting the game's engine. It'll get old fast. Give me a real reason not to barge in on enemies camps, guns-a-blazing. Overall, I'm very pleased they're looking at Zelda 1 once again and watching how others have been evolving the open-world concept since. They've also trimmed a lot of the fat that's been destroying the pacing of other 3D Zelda's. Items no longer annoy with slow text and constant reminders of what they are and what they do. Game respects that the player has some semblance of intelligence to figure out how to survive in this world and doesn't bombard with tutorials. No annoying Fi, Midna, or Navi. Its about time! Still a lot more to see and learn though. I'm curious what the story is. I haven't seen the dungeons yet, which is a series staple. I heard Audrey say the traditional dungeons are still in, and it's not just that trial crap. I hope those will be done in the style of Zelda 1 as well in that you can tackle them out of order, but some will be much harder than others ("this is hard, let's look for another dungeon and try that instead!"). I like to see my combat/difficulty issues addressed in them as well. Again, I see lot's of potential and I'm eager to play. Not my favorite game of the show, but I liked a lot of what I saw. I look forward to learning more. The graphics are incredible for a Wii U title. I wonder how this will look on NX. It's best to assume the same but with 1080p, maybe better AA and fixed 30/60 fps. 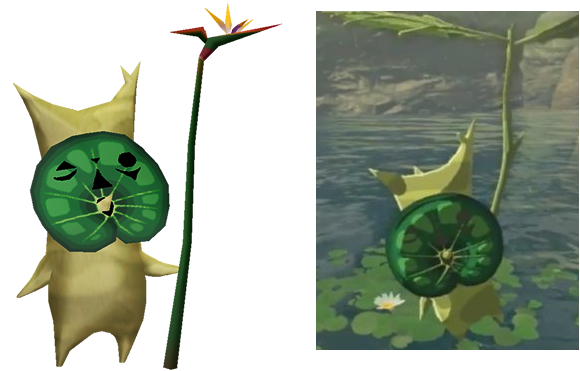 Don't know if anyone has brought this up, but the Korok isn't just any old Korok...it appears specifically to be Elma, from The Wind Waker. The Guardians and Steppe Talus looked pretty formidable to me. Six+ hearts of damage per hit, and you can stumble upon them randomly in the wild. It's the starting area of the game, so obviously it's not going to be too laden with difficult enemies...but they are definitely in the game. It's really exciting to see Zelda go down this road, but I do wonder how Nintendo will balance the final game. I see a lot of gifs that look great, but how much of the deaths seen here will translate to the final game? This will either be a challenging game or if they'll go out of their way to provide all the assisting features they usually like to add, which would be a monumental borefest in an open world like this. WWHD and TPHD are playing with the Pro Controller while supporting the GamePad's screen for features. It'll be very odd to go backwards with the one Zelda primarily made for the Wii U. That would make the NX version inferior in some way, and they might not want to give that impression. They have nothing to fear of a less than 15 million user base console. If you go to the Zelda page on e3.nintendo it says under genre "Open-Air Adventure"
What does that even mean? Never heard of that term before. It also says "1 player" so this confirms no multiplayer. The GamePad also seems to be put to good use elsewhere in the game, particularly as a real-world proxy for Link's helpful Sheikah Slate. The biggest use of this device in the demo was to serve as a Xenoblade Chronicles X-style interactive map, which, like the land it charts, scales beautifully. When we zoomed out fully on the suggestion of our Nintendo rep, we got an almost overwhelming sense of the vastness of the explorable world, but even better, when we zoomed in, we were treated to a topo-map display that showed distances and depths in lovingly-lined detail. The cartography is customizable as well; you can set 'stamps' anywhere on the map  using either the top-down plan or a first-person scope  and choose from a variety of symbols and colours to represent whatever you'd like to remember. Fascinating, thank you for this. yeah its safe to say the NX-controller wont have a screen and is probably a standard but stil unique controller. It's possible that there are different demos, maybe there's a behind closed doors one with gamepad implementation. I have been a big Zelda fan ever since Majora's Mask and I have loved every installment. It's so exciting that we've only seen a small part of BotW. We still know nothing about the story, characters, dungeons, or the world. I am very curious about the world and the backstory. It seems like we are in the underwater world of Wind Waker. We know "Calamity" Ganon is somewhere in the world and Link has been asleep for a while. It's interesting the the Sheikah monks mention the goddess Hylia, since she was only mentioned in Skyward Sword. And the tech in the world might be another connection to SS. There was a skeleton giant walking around in the trailer, which reminds me of Skull Keeta in MM. I can't wait until next spring. I want to see more. Anyone know in how many hours is the stream today? There's no touchscreen inventory management tought, there's a way to set markers in first person view and there's an on screen mini map present at all times. The above features combined make whatever implementations of the Gamepad of little use. Why are they regressing from stuff that they did better in a 6 month of development time Remaster? Just managed to watch the trailer and saw the art. - The world basically looks like Zelda meets Xenoblade Chronicles X. That's not a bad thing. - The Japanese logo seems deliberately evocative of the artwork from the original Legend of Zelda. There's a specific picture I'm thinking of where there are mountains in the background and Link is looking off at them. - I haven't seen the Treehouse video, but timeline wise, I'm guessing this game takes place post Wind Water / Phantom Hourglass / Spirit Tracks? Possibly even post Freshly Picked Tingle's Rosy Rupeeland? I think I saw a Korok. Can't buy a WiiU for this, but will wait for the NX version. Watch the streams there's 5 hours of it and they cover a lot of info regarding mechanics etc but no story, plot or character details so if it that's what you want then it's all speculation so far unfortunately. Five hours? I haven't got that kind of time right now. I love everything I've been seeing but honestly the Stealth mechanic is what excites me the most. Since timemanipulation seems to play a role and all the buildings we saw so far are ruins, my guess would be, that you will travel in time and visit some of these locations when they where still populated. Who said that time manipulation plays a role? If they have as iconic characters and as elaborate cutscenes as they had in Skyward Sword between link and Ghirahim & Co., they better not take the easy way out and let the NPCs only grunt. I want to hear them talk! Has there been any info converning voice overs that I missed? Where? Regardless, the game is still 8 months away. It doesn't strike me as XBX because so far I haven't seen Link been jumped on and immediately killed yet by a powerful enemy out of no where. The on-hands report I've read so far at least had said that it runs without issues. Who reported that? Or was it just the usual comments about the live stream? How about that stone monster? All major characters will be voiced, so we can assume Zelda, Ganon at the very least. Link is still silent though, just as it should be in my eyes. I think that it's good that there's the option not to use the gamepad for those things, but as for the rest? Hell if I know, but there's still a long way to go. In one of the shrines the Nintendo rep stopped time then gave a boulder like 8 hits to give it maximum momentum then restarted time and all the hits impoacted at once. Hope the NX is reasonable in price. Never owned a Nintendo console but I love these type of games so much. The only choppy framerate you may have seen is Nintendo's youtube stream stuttering like crazy. Game is fine. SO the slow downs and jumps during the stream happened to everyone? i thought it might be something from my side. Also the image quality was poor. Right? Btw, i didn't think those were because of performance issues of the game, just to be clear. The YouTube stream was incredibly bad. I watched a few Treehouse episodes on e3.nintendo.com. The embedded twitch stream had great quality. Either then, or this could be the tale of how Hyrule fell, aka The Great Flood. Game looks awesome and is making me consider picking up an NX next year some time.